Photo by Tom Manly, from a study led by Sophie Scott. Download PDF for poster. So says Duncan Wisbey, impressionist and voice artist on Alistair McGowan's Big Impression. 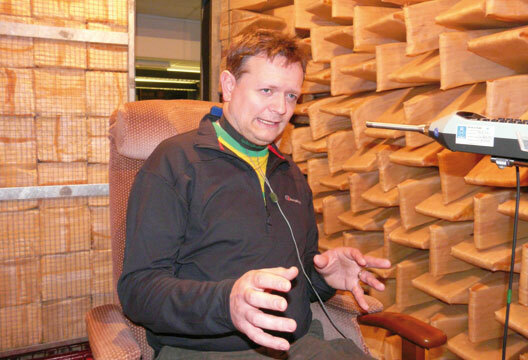 He’s sitting in an anechoic chamber and wearing a laryngograph round his neck, as part of a study led by psychologist Professor Sophie Scott (Institute of Cognitive Neuroscience). Duncan has a skill of moving from one impression to another, e.g. Peter Snow to Jools Holland, and the research explores how the acoustic properties of Duncan’s speech help make these transitions. Duncan also had his brain scanned to see how its activity changes when he is talking in different accents, and when he is impersonating someone. The results showed that specific brain systems located in the parietal lobe and sensory motor strip come into play when Duncan changes his voice, suggesting he uses brain areas associated with visual imagery and bodily representations. Duncan says he uses strong visual images to guide his impressions and accents, and the brain imaging results corroborate this. Furthermore, when Duncan talks with an accent, brain imaging shows more activation in ventral prefrontal and anterior temporal lobe areas, suggesting that he may be paying more attention to the sound of his voice than when he is impersonating someone specific. in nature for its structure and complexity, and this has been a wonderful chance to investigate the brain of a skilled voice artist.